A beautifully illustrated paraphrase in a dynamic graphic-novel style. Text size: 6pt. Illustrator Jeff Anderson, best known for his work on the Judge Dredd comic series, uses his skills to great effect in this superbly illustrated graphic Bible. 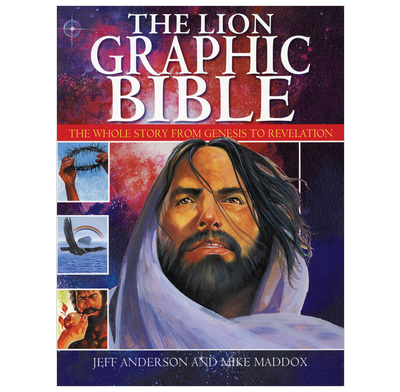 This helpful paraphrase connects teenagers with the stories of the Bible by presenting them in a dynamic, graphic-novel style. It is a large format, 265 page volume covering both Old and New Testaments. Will appeal to everyone from age eight upwards who likes comics! Quite simply brilliant! A powerful 256-page package which is sure to communicate well to this most visually-orientated generation. Outstanding. Alternately exciting, gritty and even humorous. Presents the truth of the bible in a lively and exciting way. (6 & 8 yrs old). 1. The first salvation promise of God through Jesus Christ (he will send a child born of woman to crush Satan) to Adam & Eve in Genesis 3:15 is entirely missing. All that is said is "As for the serpent God put him under a curse. He must crawl on his belly in the dirt. He would bite at the heels of humanity. He would be hated, hunted down and killed" (with a drawing of a live snake). 2. There are a number of drawings of Old Testament women wearing strapless tunics (ie fully bare shoulders, decollete and upper arms) - in public. This is historically inaccurate, and an unnecessary distraction for readers from a Muslim background. It suggests that the women (eg Sarah, Rebekah) were immoral. Will not use this book, will use instead The Action Bible New Testament, and The Big Picture Story Bible (which explains Genesis 3:15 as "God promised that one day someone would come and crush Satan's power over people" (with a drawing of Jesus, arms outstretched as if on the Cross, standing over a dead snake).